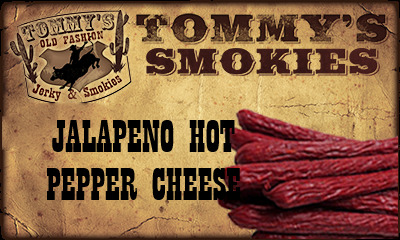 Wonderful blend of jalapeno's, beef, and snappy hot pepper cheese. Seasoned to perfection. We should have named this one ADDICTION!!!!! Looking for a great, high protein snack? Tommy's Jerky Outlet features over 50 different varieties of all-natural jerky at our dedicated jerky store in Grove City, OH. We have taken ordinary jerky to a whole new level with our wealth of flavors and variety of meats. We have a wide range of spice levels ranging on a scale from 1 to 10, 10 being extremely hot to our lightly sweet Tender Teriyaki to our blazing Diablo flavor, ensuring that all jerky lovers can find a flavor they enjoy!